After retracing from last week’s downtrend, it appears the move lower may resume after finding resistance at 104.00. I used a simple Fibonacci tool on the pair and it looks like the retracement got no higher than the 50% retracement level. Stochastics also show the the pair is at short term overbought levels giving us another indication that the pair may resume lower. I am hoping that volatility will take the pair slightly higher for a better price to jump in. 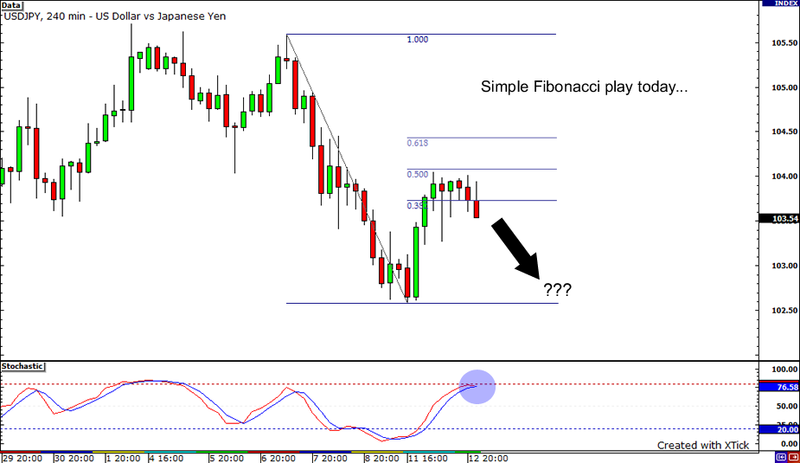 I’d like to short just below the 38% Fibonacci retracement level. Stay tuned…good luck and good trading! On a side note: Check out FreshPips.com! This is a new “Forex News” site where users can submit news from around the net and vote on which may be the most helpful in Forex trading. I think it’s a great idea and hopefully we can get it going! So, sign up today!